First, this is the first of the month, so hop over to the Hot Flashes page and read this month’s Hot Flash (micro-mini story). 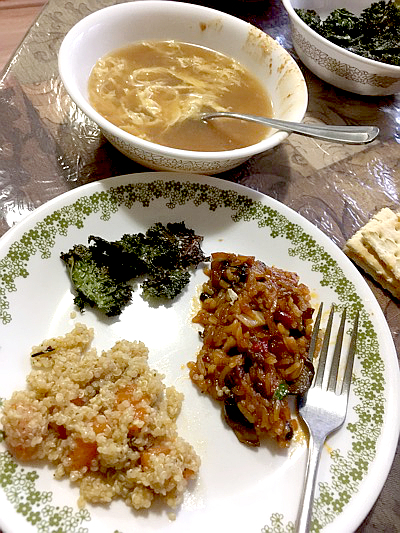 #4 Daughter, the amazing Sara Marian, visited with us last week, and I made this dinner one evening. At the top of the picture is egg drop soup. I actually used chicken bouillon that evening, but vegetarian bouillon would have been just as good. Bring the bouillon water to a boil. Add the rice noodles and cook for about three minutes. As the noodles cook, stir in lemongrass and miso pastes, making sure they’re dissolved. Remove from heat, pour the beaten eggs into the hot broth. Count to three, stir the pot, and let sit for a few minutes while the eggs cook. At 12:00 on the plate are kale chips. Pull kale leaves from the stems and tear them into pieces. Toss with olive oil and salt (not too much oil, or they’ll be greasy!). Spread in a single layer on a baking sheet and bake at 350F for about 20 minutes. Check often; they’ll go from soft to scorched in a heartbeat. I posted the recipe for this at Fatal Foodies yesterday. Heat oils in a skillet. Add mushrooms and onions and cook until the onions are soft and the mushrooms ar browned. Add the garlic, bok choi, and rice. Cook, stirring, until hot through. Add the Pad Thai sauce, reduce heat and simmer while you wait for #4 Daughter to get in from work. This entry was posted in Food. Tagged recipes, vegan, vegetarian. You seem to have forgotten the chunks of roasted chicken breast, but I won’t take off too many points. The rest of it looks very good. Except for the kale chips. Darn! I knew I was forgetting SOMETHING! lol And kale chips are YUMMY! Even people who don’t like kale usually like those crispy devils. YES. I would like. YES. MMHM. I will be having all the soup! I buy the kale chips — we eat them too quickly to warrant my time in the kitchen. Marian, would you be a dear and tell me which BRAND of miso paste you buy? Joey would love to share..One-Liner Wednesday — And a shelly is a baby what? I found some Genmai certified organic. Can’t remember where I found it! Maybe the health food store, maybe a little store just off the Corydon town square that has a lot of gluten-free and organic stuff. Another Hot Flash success! Yay! Nice work on the feast. I’d pull up to the table! Thank you! Very simple and delicious recipe!